A nicely sized minimalist writing desk, with a file size drawer pedestal. Full length pencil drawer. 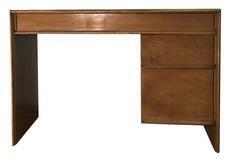 This modern desk is from Robsjohn-Gibbing's later work, perhaps his last broad collection for Widdicomb. Molding detail conforms fully around the desk, allowing it to nicely float in a room. The "Residence Collection" monikor may be a Bloomingdales marketing name. Very good condition, with signs of use to front edge. Small blemish to top. Widdicomb quality.